Say you’re a Delmarva Power customer-chances are, you are-and you’re annoyed energy costs are going up-which they are-then you will be pleased to know you are going to be paying a tad bit extra for the privilege of utilities. The News Journal is reporting that Delmarva Power customers should expect a 67-cent surcharge on their utility bills. It will be 61 cents in July, according to the article. The goal is to collect nearly $446,000 in July and $505,000 in August to fund the building of a Bloom Energy generating station in Newark this year, and then they will collect more money for a station in New Castle next year. William Nelson, an analyst with the Bloomberg New Energy Finance, says Bloom’s contract with Delmarva and the state already has Delmarva customers paying about a third more than they otherwise would to satisfy Delmarva’s renewable purchase requirements. Leveen is no fool when it comes to environmental policy. He has an M.S. in Chemical Engineering from Iowa State University, and he has testified in front of the US Senate as an expert on fuel cells before. His bio is here: http://bit.ly/L0wBKP. We at CRI want to make it clear we are not opposed to renewable energy, as some of our detractors claim. In fact, we are unequivocally for clean, affordable technology that reduces dependance on foreign energy and can keep our environment clean to boot. We are opposed to government subsidies of this technology in place of the private sector’s research and development, especially when we can prove this Fuel Cell technology IS NOT EFFICIENT, and is also more expensive. The fact that Bloom’s technology is not going to work as they claim is of no concern to them, and apparently it is of no concern to the state government. Rather, they rely on “feeling good” about “caring” for the environment, and in their world, the ends justify the means. Simply put, as long as their intentions are righteous and for all that is good, whether or not the fuel cells will actually cause more pollution (884 pounds of Co2 per fuel cell per megawatt hour), or will raise the price of energy on poor and middle-class Delawareans is of no concern to them. Bear in mind the biggest advocates for this technology without a public hearing of its efficiency,cleanliness and/or value to the state are often upper-middle class and upper-class folks whose good intentions are more important than the actual truth of the matter. If they have to pay a little extra in taxes for “clean” air, so be it. If you can’t afford it? Well, they just want what’s best for everybody. Complainant wants the Delaware Public Integrity Commission to sanction Delaware’s insurance commissioner for unethical conduct and no-bid contracts. A Lewes businessman has filed a complaint with the Delaware Public Integrity Commission accusing Insurance Commissioner Karen Weldin Stewart of violating state law. CRI’s 10-month investigation found that Delaware taxpayers might not be getting their fair share of the millions of dollars the department receives in fees and taxes from insurance companies it regulates. Based on numerous interviews, court records and nearly a dozen Freedom of Information Act (FOIA) requests, CRI uncovered questionable hiring practices, questionable contracts for campaign donors, failure to comply with state law and millions of dollars paid to out-of-state consultants in no-bid contracts. In his complaint, which was filed with the Commission earlier this month, Hudson alleges Stewart violated several areas of the Delaware Code including: contracting and procurement regulations, the Code of Conduct for elected officials, and rules regulating the use of state-owned vehicles. Stories published by CRI have shed light on the commissioner’s penchant for issuing no-bid contracts to out of state firms, as well as using a state-owned vehicle on evenings, weekends and holidays. Hudson was most troubled by a $700,000 no-bid contract Stewart awarded to a New Mexico financial services firm to conduct pre-tax audits of insurance companies based in Delaware. Hudson included copies of several stories published by CRI to buttress his allegations. Stewart was not willing to be interviewed for this story. After receiving a sworn complaint, the commissioners have several options, according to the agency’s attorney Janet A. Wright. If the complaint is found to be frivolous or outside the Commission’s jurisdiction, it will be dismissed, Wright said. “In general, if a violation is found, first there will be a probable cause determination, and then it goes through a full-blown trial procedure,” Wright told the Caesar Rodney Institute. If the complaint involves an elected official, Wright said the only administrative penalty the Commission can issue is a formal public reprimand. The Commission can, however, refer a case for prosecution. “If it rises to the level where the commission suspects criminal laws were violated, we can refer it to the Attorney General or any appropriate federal government agency,” Wright said. Regulatory Insurance Services receives $1 million per month from the Delaware Department of Insurance, but former staffers say the well-connected firm has been misclassifying its employees to avoid paying federal and state taxes for more than 16 years. John Tinsley III is known as the “shadow commissioner” of Delaware’s Department of Insurance. He’s been the behind-the-scenes shot caller for two of the last three insurance commissioners. Tinsley is a principal at INS Regulatory Insurance Services (InsRis), a Pennsylvania-based financial services firm whose name has morphed over time, while its power and political connections have grown. Three of the four InsRis principals, including Tinsley, have all at one time been employed by the Delaware Department of Insurance. At a joint hearing of the House and Senate insurance committees held last month, Delaware Insurance Commissioner Karen Weldin Stewart introduced Tinsley to the lawmakers as her “special deputy for examinations” even though he is a contractor and not a state employee – a fact Stewart omitted from her testimony, until she was questioned about the relationship by lawmakers. Tinsley is copied on nearly every significant issue at the Department of Insurance – even issues that do not involve his contract – according to e-mails obtained by the Caesar Rodney Institute through a Freedom of Information Act (FOIA) request. He often accompanies Stewart and her staff on trips to law firms in New York and elsewhere. Stewart’s department pays InsRis more than $1 million per month to audit insurance companies based in Delaware, a requirement paid for by the insurance companies themselves. The costs of the audits vary depending upon the size of the firm and the complexity of the probe. The larger firms can pay more than $1 million per audit. InsRis, their examiner and the insurance department divide the fees according to set rates. Several former InsRis examiners told the Caesar Rodney Institute that the firm intentionally misclassified them as independent contractors rather than actual employees, to avoid paying payroll taxes, operating costs and other benefits, including state taxes. The practice, which they say first began in 1993, has already cost taxpayers, and could cost InsRis millions in penalties, back taxes and interest. Neither Stewart nor Tinsley were willing to be interviewed for this story. Going after firms that intentionally misclassify their workers to avoid paying their fair share of taxes is one of the top investigative priorities for the Internal Revenue Service, according to Special Agent Shauna Frye, spokesperson for the agency’s Philadelphia Field Office’s criminal investigation unit, which oversees Delaware. It’s an investigative priority that can result in lengthy prison sentences. The IRS has a responsibility to clearly establish willfulness – knowledge of the difference between an employee and an independent contractor, Frye explained. Nationally, firms that intentionally misclassify their staff to save money are seeing increased scrutiny from both the IRS and the U.S. Department of Labor. Solis’ $117 billion budget includes $25 million for the “Misclassification Initiative,” which will allow the Department of Labor to hire 100 additional enforcement personnel to target firms that willfully misclassify their workers as independent contractors, and provide grants and incentives for the states to address the problem. Delaware has made some effort to prevent intentional misclassification of some workers, but only those employed in the construction industry. Meanwhile, other more lucrative industries were ignored. In July 2009 Gov. Jack Markell signed the Workplace Fraud Act into law. It provides civil penalties of up to $5,000 for every violation, but it applies only to the construction industry. The IRS uses an 11-point test to determine whether a worker is an independent contractor or an actual employee. According to the former InsRis staffers, it is a test their former firm fails miserably. The criteria for the test consist of establishing the amount of control a firm has over their workers: behavioral, financial and relationship control. Nicholas A. Mirkay is an associate professor at the Widener University School of Law. Mirkay received his J.D. from University of Missouri – Columbia School of Law in 1992, and an LL.M. in Taxation, with distinction, from Georgetown University Law Center in 1996. He spent two years in the IRS’ Office of Chief Counsel. His private practice has focused on federal, state and local taxation of business. Misclassification, Mirkay said, is an issue the IRS has been fighting for decades, but one that’s relatively simple to understand. The former staffers said InsRis controlled nearly every aspect of their job. InsRis, they said, hired them, brought their names to the commissioner and scheduled all of their audits. The firm told them where to be, who to contact and even what type of dress was appropriate for the workplace. The firm provided paid training and once a year scheduled an annual conference for all of the examiners. They were directed to contact an InsRis principal if they had questions, and were warned against going outside the company’s chain of command. No aspect of their job was as rigidly controlled as their audit reports. The examiners submitted them to InsRis, and their supervisors went over them in great detail before submitting them to the insurance department. Sometimes these reviews could take several months. InsRis reimbursed their expenses, and paid them with company checks. The examiners were paid based on an hourly rate. In theory, they said their time was broken into daily/eight-hour blocks. In practice, this amounted to an hourly rate of pay. The employees said InsRis had strict rules about the amount of time they could spend on each audit, and questioned them when they exceeded this limit. They were also questioned if they finished an audit early, because the firm would receive less money. Once hired, their relationship with InsRis was one of permanence. They went from one audit to another, indefinitely, without signing new contracts. The contracts themselves do not specify an end date, and can only be terminated by both parties in writing. Mirkay said misclassification-related issues are found in more industries than just the construction trade. Mirkay pointed out that the IRS is not the only agency likely to be interested in this possible misclassification. Delaware’s unprofitable captive insurance bureau will continue to flounder, unlikely to see any new revenue dollars, unless there are substantive reforms, national experts say. Reputation is everything within the highly-competitive captive insurance industry. Firms looking to create a captive insurance company, which is a cost-saving form of self-insurance, are courted by an ever-growing list of potential domiciles – states and countries eagerly seeking their business. The domiciles want access to the taxes and fees the captives will contribute to their state budgets once they’re operational. Some states with active captive programs can see millions of dollars transferred into their general funds. The up-front money for a potential captive, which can consist of salary for a captive manager, audits, financial and pre-qualification reports, can sometimes exceed $100,000. If there’s even a hint of impropriety at a potential domicile, the captive will run away and locate elsewhere. There are nearly a hundred diverse domiciles worldwide who will gladly take their business. It’s a buyer’s market. When considering a potential domicile, national captive insurance experts say their industry’s wants and needs are simple: efficiency, expertise, and most important – stability. If Delaware’s captive insurance bureau wants to compete globally, and actually generate revenue for the state instead of losing $100,000 as it did last year, these three specific areas must be addressed and improved. The bureaus tarnished image must also be cleansed. “A domicile’s reputation is certainly a significant element of the decision on where to domicile,” said Dennis P. Harwick, president of the Captive Insurance Companies Association (CICA), which is the only domicile-neutral association of captive insurers. Christina A. Mancini is a partner and CEO of Captive.com, a Web site that has become required daily reading for the world’s captive insurance industry. The partnership launched the site in 1995. It is sponsored by some the largest service providers in the industry. Today Captive.com generates more than a half-million “hits” per month from some 40,000 unique visitors. She tracks media reports pertaining to her industry, and sends out regular notifications of newsworthy developments. Few people are better positioned to track trends within the industry, and fewer still know what the captives are looking for when considering a new domicile. The series revealed Delaware Insurance Commissioner Karen Weldin Stewart’s proclivity for awarding lucrative no-bid contracts to friends, campaign donors and out-of-state consulting firms – possible violations of Delaware’s procurement and contracting regulations. CRI revealed how Stewart awarded a $16,000-per-month contract to Steve Kinion, who is currently the director of the captive bureau, although he has had several titles within the insurance department, even though Kinion lives in Springfield, Illinois, where he maintains a thriving law firm. These issues, Mancini believes, may or may not impact the bureau’s ability to obtain new captives. The insurance commissioner was given the opportunity to defend and clarify some of the issues raised about her stewardship of the insurance department when she testified before the House and Senate insurance committees two weeks ago. Rep. Michael Ramone, R-Middle Run Valley, said the commissioner’s testimony raised more questions than it answered. Stewart refused to be interviewed for this and every other story CRI has published. Her refusal to comment, Mancini said, is troubling. “I guess one would have to wonder why,” she said. “I have been bullish about Delaware for several years, and I think I speak for the industry in wishing them success. Openness and transparency are needed to put this situation to rest. Since Stewart was elected in 2008, the Delaware Department of Insurance has seen a revolving door of deputy commissioners and captive directors – a far cry from the stability Mancini and others say is so necessary if the state hopes to compete globally and build relationships within the industry. “Mr. Steve Kinion, who carries the title of Sr. Advisor to the Commissioner and is, for all practical purposes, the de facto Deputy Commissioner…” according to an e-mail sent April 29, 2009 by Stewart’s chief of staff Elliott Jacobson. “I am appointing Edmond M. Ianni as Deputy Insurance Commissioner…” Stewart wrote in an e-mail May 5, 2009 to Office of Management and Budget director Ann Visalli. “That salary is higher than any cabinet secretary in the state – we will have to discuss tomorrow,” Visalli wrote hours later in her reply. “Under the direction of my Deputy Commissioner Gene Reed, a task force within the department has been meeting to discuss these issues identified by physicians,” Stewart wrote in a press release sent last month, defending her department’s actions in response to an editorial that accused her of not responding to pre-authorization denials. Changing senior staff and their duties is in direct opposition to the stable working relationship sought by potential captives, which has become standard practice at other domiciles such as Vermont, the largest captive domicile in the United States. Delaware had one of the industry’s best-known and most-respected captive experts on staff when Stewart was elected, Bill White, whose 25 years of traditional and captive insurance experience dwarfs that of any of Stewart’s expensive appointments. White was picked by Stewart’s predecessor Lt. Gov. Matt Denn to launch Delaware’s captive bureau, after he successfully created and launched Washington D.C.’s captive program. Rather than retaining White and his world-class contacts within the captive industry, three months after taking office, Stewart forced him out the door. During her testimony before the House and Senate insurance committees, Stewart blamed White’s “sudden” departure from the captive bureau as the reason she awarded no-bid contracts to Kinion, Ianni and her personal friend Mary Jo Lopez. White left her in the lurch, she told lawmakers. Instead, White vividly recalls a conversation he had with the commissioner in February 2009, on the drive home from Dover, after he and Stewart met with the Joint Finance Committee. White had already envisioned several goals for the captive bureau. He was looking forward to discussing his ideas with the commissioner and seeing them implemented. White never got any answers. Instead, he was told to make room for Kinion, Ianni and Lopez. “She said, ‘Bill you need to come up with a plan that includes these people,’” White recalled. Stewart was somewhat vague about the roles the three contractors would play within the bureau. None had any captive experience, although Kinion was a respected regulator on the traditional insurance side. Stewart said Lopez would become the bureau’s Director of Business Development. Stewart, through her appointees, made it clear she wanted her people in the bureau, not anyone appointed by Denn. White resigned two months later. White is not bitter, and his skills are very much in demand – even more so than when he worked within Delaware’s bureau. He politely declined to discuss recent industry buzz about where he is going to establish a captive program next. White’s suggestions for fixing Delaware’s captive bureau would still work today. They’re simple, cost-effective and could be implemented overnight. White has heard from colleagues within the captive industry they have trouble getting someone from within Delaware’s captive bureau to even return phone calls. 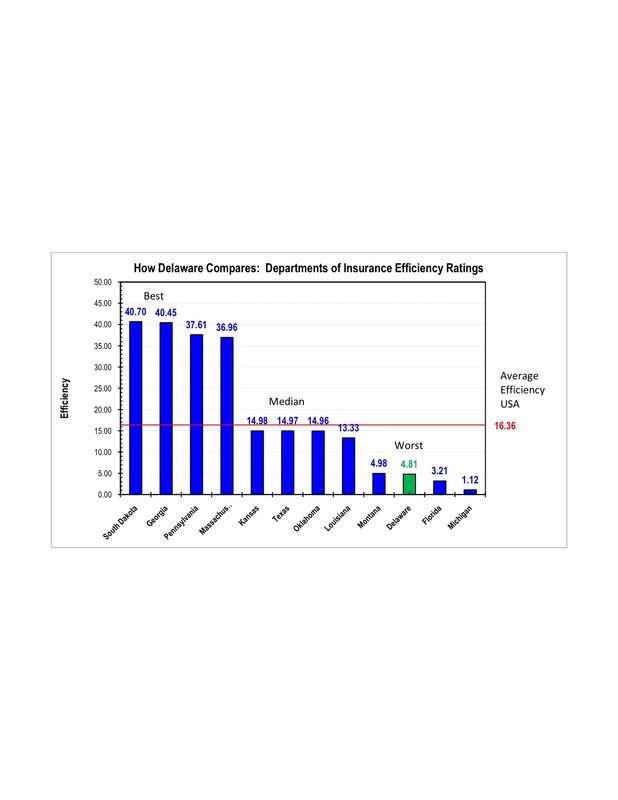 The Delaware Department of Insurance ranks 47th in the country in terms of efficiency, according to data supplied by the National Association of Insurance Commissioners that was analyzed by CRI. Delaware is one of only 11 states that elect their insurance commissioners. The rest appoint industry experts to the role. 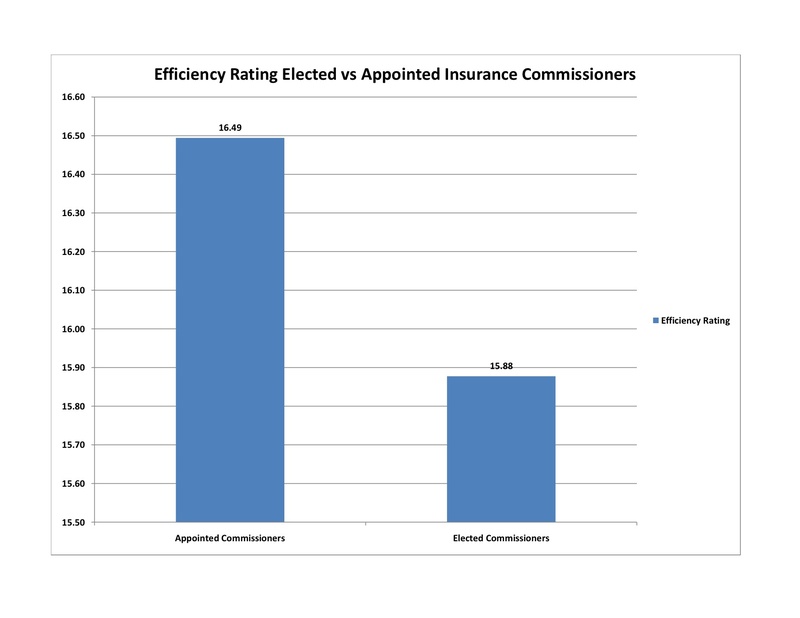 Appointed insurance commissioners have consistently higher efficiency ratings than elected commissioners. The higher the efficiency rating, the more “bang for the buck” the states receive in terms of revenue from their insurance departments. 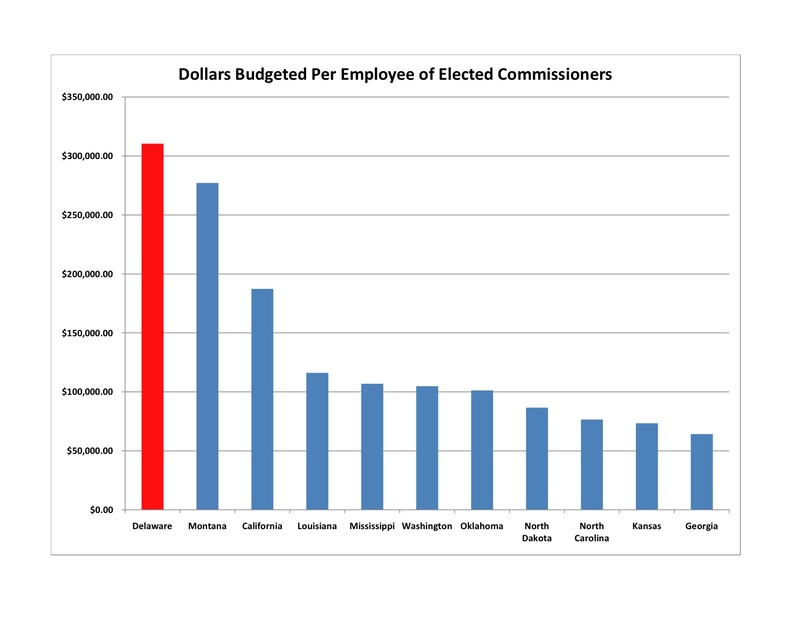 Of the states with elected insurance commissioners, Delaware ranks last in terms of efficiency, budgeting more dollars per employee than the other states. Shaun Fink is executive vice-president of the Caesar Rodney Institute. Vermont’s captive insurance division, which is 800-percent larger than Delaware’s captive bureau, runs leaner, produces more and pays its director and senior staff half as much. Vermont first began courting captive insurance companies, which is a form of self-insurance, in 1981. Since then, it has grown into the largest captive domicile in the United States, and the third largest in the world, behind only Bermuda and the Cayman Islands. The Green Mountain State boasts that it is home to captive companies created by 42 of the Fortune 100 companies, and 18 of the Dow 30 companies have captives domiciled in Vermont. Vermont’s 888 captives generated more than $24 million in taxes and fees last year – money that was transferred into the state’s General Fund. According to a 2007 economic study, Vermont’s captive industry has created more than 400 direct jobs and 1,400 indirect jobs. By comparison, Delaware’s captive bureau, which has 53 captives, lost money last year, operating more than $100,000 in the red, partially due to the six-figure salaries paid to it’s top three staffers, all of whom were hand-picked by Stewart. “In the 1980s, Delaware had the opportunity to be what Vermont is today when captive legislation was signed into law,” Stewart wrote in a guest column published April 8 by The News Journal. She was not willing to be interviewed for this story. As Stewart pointed out, Vermont can serve as an example of what her department could be. However, when the two are compared, it becomes clear Vermont can also serve as an example of what the Delaware Department of insurance and its captive bureau should be. An examination of business practices at the Vermont Captive Insurance Division, and its insurance department, revealed its success is only partially due to the 30-year head start it had in the highly-competitive industry. Both Vermont’s insurance department and its captive division run leaner and produce more because they have successfully avoided many of the management mistakes and missteps still plaguing the Delaware Department of Insurance. David Provost, Vermont’s Deputy Commissioner for Captive Insurance credits a number of factors for his division’s success. Vermont’s small size, like Delaware’s, also played a significant role in luring the businesses. Long-term backing from both lawmakers and industry, Provost explained, is vital to Vermont’s success. Vermont pays its top three captive officials less than half of the hefty salaries received by Delaware’s captive officials. Provost earns $90,272 per year. His Director of Captives makes $75,213 and the division’s Director of Financial Examinations makes $72,758 per year, according to Gov. Jim Douglas’ proposed budget for fiscal year 2011. By comparison, Delaware’s captive bureau director Steve Kinion is paid $192,000 annually. Edmund Ianni, Delaware’s Director of Strategic Development makes $195,996 and Director of Business Development Mary Jo Lopez makes $168,000. Kinion, Ianni and Lopez are contractors. None are actually state employees. Kinion lives and works in Springfield, Illinois, where he’s a principal at a successful law firm. Lopez lives in New Jersey. By comparison, all of the top staff and employees working in Vermont are actually state employees, who live within the state’s boundaries. Vermont’s insurance commissioner is appointed. Delaware’s insurance commissioner is elected. According to data from the National Association of Insurance Commissioners (NAIC), insurance departments with appointed commissioners are more efficient. Stewart is one of only 12 elected commissioners in the country. Vermont’s captive division is totally transparent, posting its earnings, profit and loss statements, and a 120-page annual report online. There is very little public data available regarding Delaware’s captive bureau. The Vermont Department of Insurance operates far more efficiently. It keeps 10-cents of every revenue dollar brought into the department. Delaware keeps 20-cents of every revenue dollar. . In other words, Vermont’s Insurance Department contributes 90 cents out of every revenue dollar to Vermont’s General Fund whereas Delaware’s Department of Insurance contributes only 80 cents out of every revenue dollar to the General Fund. Finally, Vermont brings in 9.9-times more revenue than it spends. Delaware brings is 4.8-times more revenue than is spends. According to their budgets, the Delaware Department of Insurance allocates $200,000 more per individual employee than Vermont: $310,000 per employee in Delaware, compared to $110,000 per employee in Vermont. Stewart has been criticized for awarding no-bid contracts to out-of-state law firms, including several who donated to her campaign. Vermont’s Department of Insurance does not utilize outside counsel. “We have our own internal legal staff,” Provost said. Provost offers one bit of advice when he speaks to officials from other states seeking to create or grow a captive insurance program. Delaware Insurance Commissioner Karen Weldin Stewart and her staff testified for more than two hours Tuesday before a joint hearing of the House and Senate insurance committees about problems and concerns within the Department of Insurance – including many issues that were raised by the Caesar Rodney Institute as part of its ongoing investigation of the DOI. In the nine months spent researching its special report titled “Delaware Dept. of Insurance: Not in the Public Interest,” CRI became very familiar with the operations of the insurance department, including the functions of its Captive Insurance Bureau, which became the topic of discussion during the joint hearing. Some of the comments made Tuesday, CRI has learned, require clarification for the lawmakers and members of the public who are rightfully concerned that the DOI may not be functioning as efficiently as possible, since every dollar the department doesn’t spend is required by law to be transferred into the state’s General Fund. What was said: Several committee members were outraged at the salaries paid to the top three officials of the captive bureau, who were all hand-picked by Stewart. Steve Kinion and Edmund Ianni each receive $16,000 per month. Mary Jo Lopez is paid $14,000 per month. Stewart and Kinion defended the exorbitant salaries, describing them as “all in,” in that the three top staffers do not receive any additional public monies or reimbursements for travel or expenses. What CRI has learned: This statement is only partially true. Neither Kinion nor Ianni appear to be receiving reimbursements. Lopez, however, has received more than $5,000 in travel reimbursements, according to the state’s online checkbook. Lopez, through her corporation Affinitee Group, LLC, of which she is the only officer, first began receiving travel reimbursements in April of last year. What was said: Stewart defended her penchant for issuing lucrative no-bid contracts for professional services, a practice that has drawn the ire of the Office of Management and Budget, by telling lawmakers she is not required to solicit competitive bids. “As a statewide elected official, according to Title 18, section 307 of Delaware Code, I have the authority to hire experts as they’re warranted,” she told the lawmakers. What CRI has learned: This statement is only partially true. Title 18, § 307 of Delaware Code, does give the insurance commissioner the authority to hire and appoint “examiners, clerks, technical and professional personnel, and other necessary assistants,” as she sees fit. However, the statute cited by Stewart does not grant the insurance commissioner the authority to circumvent the state’s procurement and contracting regulations contained in Title 29 of the state’s code, according to several attorneys consulted by CRI.